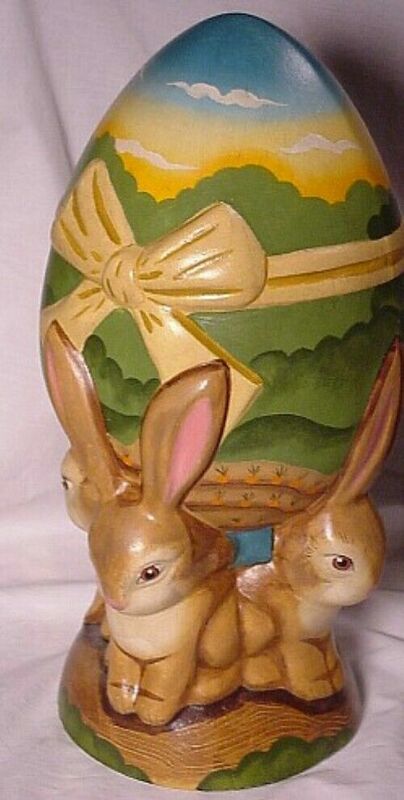 Vaillancourt Folk Art, New 2006 , Very Large 4 Bunnies Holding Sunrise Easter Egg, No. 2006 - 01 - # 26 - 2006. A great piece that will surely make your Holiday Display breathtaking because of it's size, creativity and wonderful painting. The 4 Bunnies are so cute and the Egg makes the start of everyday wonderful too. It measures 12 inches tall and is in perfect condition. It was beautifully done by Vaillancourt's artists , American Made and personally signed by Judi Vaillancourt.AS ALWAYS YOUR SATISFACTION is 100% guaranteed!